LVN (Licensed Vocational Nurse) and RN (Registered Nurse) are the most popular healthcare professions in the United States due to the vital role they play in patient care. Although some of their work overlap, they are distinct careers which most people still find it hard to comprehend. The educational background, scope of work, and salaries differ significantly. 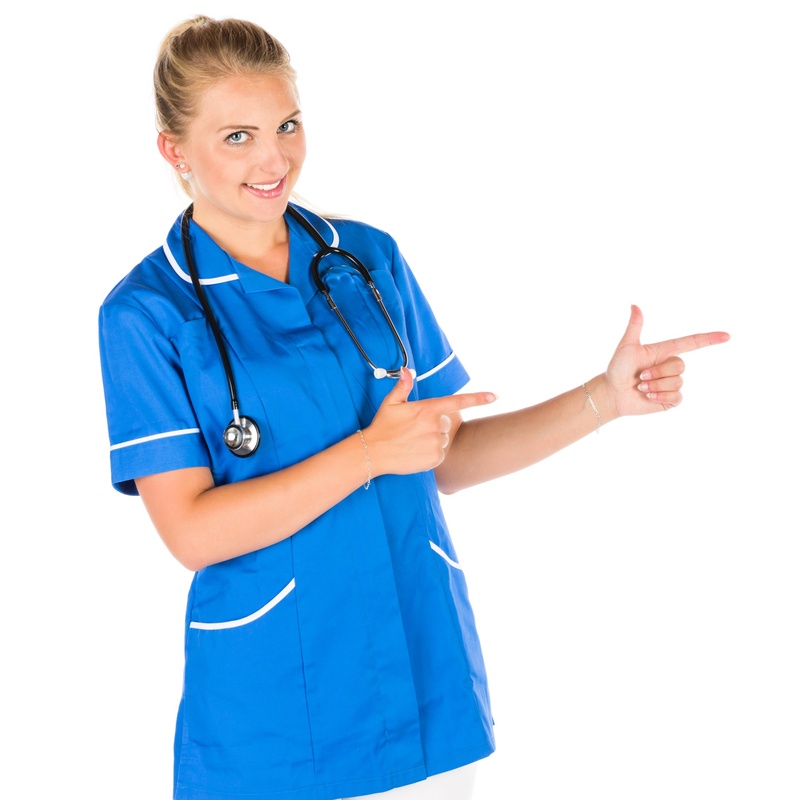 This article breaks down the key differences between the LVN (Licensed Vocational Nurse) and the RN (Registered Nurse). Note that LVN is often interchanged with LPN (Licensed Practical Nurse). The State of California and Texas are the ones that predominantly use LVN while the rest of the US uses the LPN. As in the name, the LVN is a licensed vocational nurse that has a limited scope of work, minimal educational background and lower earnings than the registered nurses. For one to become an LVN; there’s an accredited nursing program to complete and it lasts for a minimum of a year full-time and about 18 months for a part-time study. In the program, strictly nursing courses such as anatomy, physiology, biology and pharmacology are done, followed by a supervised clinical practice. Upon finishing the program, one has to write the NCLEX-PN exams to be a licensed vocational or licensed practical nurse that is recognized in all the states. Note that the responsibilities of the LVN can differ based on the state or healthcare facility one works in. LVNs work under the delegation and supervision of registered nurses and physicians. But, experienced LVNs can also supervise the subordinate nursing assistants or medical assistants. These nurses are expected to possess a range of skills and competencies which include, among others, pharmacology, preventative nursing care, medication administering, anatomy and physiology, ethical principles, therapeutic care, restorative and rehabilitative patient care. The places where LVNs work include the outpatient care, hospitals, physician’s surgeries, and long-term care healthcare facilities. The responsibilities can differ per work setting. Generally, LVNs’ (Licensed Vocational Nurse) scope of work include taking vital signs, changing bandages, catheters, reporting patient care change to RNs or doctors, monitor patient’s recovery, document and maintain the records of patients. All these have to be performed under the supervision of the RN. Salary-wise, The Bureau of Labor Statistics have reported the average earnings of $42 040 per year for LVNs. The highest paid got over $57000 a year. The agency also predicts the growth of LVN careers by 22% until the year 2020. This growth will be propelled by the increasing demand of basic medical and health care especially among older citizens. RN is the registered nurse that is recognized in all the states. In addition to the education, registered nurses also have to write NCLEX-RN exams which are more challenging than the NCLEX-PN exams. These ones assess critical thinking and decision-making of registered nurses. The Registered Nurses require more education to practice. Generally, there are three paths to follow, viz. a diploma in nursing science, an associate of Applied Science in Nursing (ASN), and a Bachelor degree in Nursing Science (BSN). The first two takes a minimum of two years while the BSN takes four years to complete. Registered Nursing programs have enough time to reinforce the knowledge in many areas of nursing, management and other related sciences. For instance, the first two years in the Bachelor of Nursing (BScN) can be dedicated to fundamental English, Mathematics, Chemistry, and Science Modules. Then the remaining years may be dedicated to physiology, anatomy, nursing, microbiology and a supervised clinical practice. 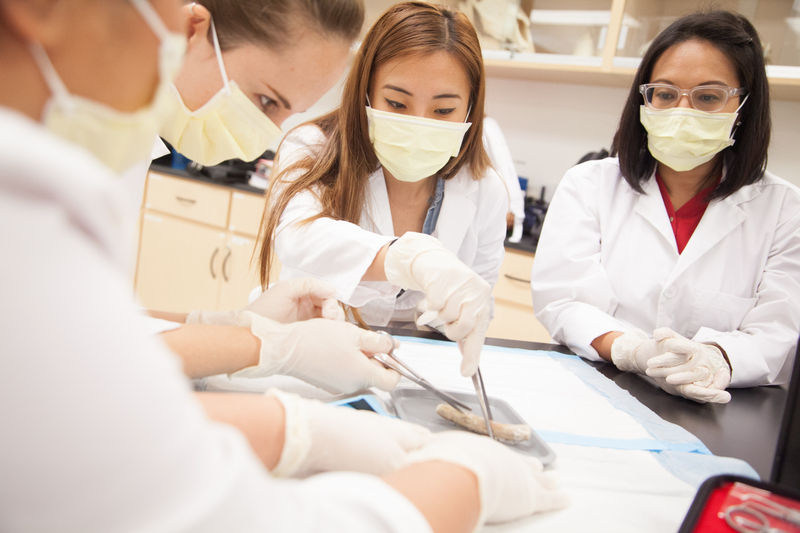 The BSN is more in-depth than the Associate degree and the Diploma. But, they have the same scope of work although the BSN holders may receive preference in some work settings especially management roles. Although RNs take orders from doctors, they can also work independently in some areas. An RN can advance the education and become an Advanced Practice Registered Nurse (APRN) who can work completely independent and even have his or her own practice. RNs with master’s degree are more privileged and often command higher salaries. The job responsibilities of registered nurses are many. They include dispensing and administering medications to patients, educating patients about their well-ness, compiling patient’s symptoms, diagnosing and analyzing test results, supervising LVNs/LPNs, and working hand-in-hand with other healthcare professionals. Moreover, RNs can decide to specialize in many healthcare niches which include pediatrics, clinical nursing, family practitioner, and geriatrics. If not these specializations, one can climb the leadership hierarchy of any healthcare facility. The workplace settings include the nursing care facilities, government agencies, hospitals, physician’s offices, military camps, educational facilities, advanced life-support facilities, and administrative services. RNs are immensely compensated compared to other occupations. The Bureau of Labor Statistics has reported their median earnings as $69110. It is projected to increase due to an increasing demand. However, there are certain factors that influence the figures and they include the experience, geographical area, and the type of healthcare facility one works in. If one works in a State where nurses are in high demands, then salaries can skyrocket to lure more professionals in the industry. From 2010 to 2020, the job prospects are expected to increase by 27%. RNs have even more opportunities of traveling to underserved areas as an initiative of the United States to help other areas. Such areas need the expertise and the experience of nurses at lower costs in the absence of physicians. Compensation for such travel opportunities is immense. The student loans can be off-set or if one has a loan it can be repaid in an exchange to work in underserved areas. These travel opportunities are provided by the National Health Service Corps as a government initiative. RNs have more educational backgrounds than the LVNs. They can further studies in Bachelor of Science in Nursing, Associate Degree in Applied Science and a diploma in nursing. On the other hand, the LVN can complete a year’s certificate from accredited nursing programs and then get a license thereafter. LVNs earn less than the RNs due to limited work responsibilities and minimal qualifications. They basically work under the delegation and supervision of RNs. RNs and LVNs can work in the same work settings because some of their work overlaps. LVNs cannot work on their own without being supervised by the RNs or physicians. RNs can work independently and can have their own practices following an advanced study. RN requires more education that can take from 2 to 4 years. But LVNs can also take the transitional programs and eventually become the registered nurses. Both RN and LVN take orders from the doctors. Lusi Madisha. 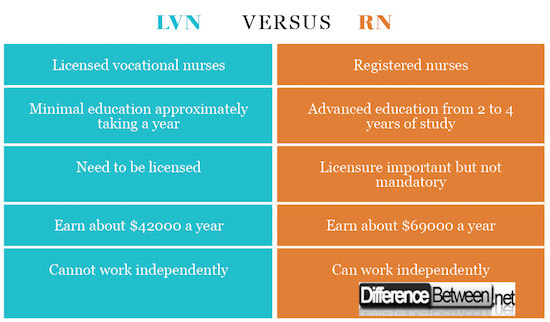 "Difference between LVN and RN ." DifferenceBetween.net. March 8, 2018 < http://www.differencebetween.net/technology/career-and-certifications/difference-between-lvn-and-rn/ >. Claywell, L. LPN to RN Transitions. Elsevier Health Sciences (01 Jan 2013).